CHICAGO SEPT. 2013 – Sony Electronics announced today four new IP cameras that feature the company’s IPELA ENGINE EX signal processing system. These cameras strengthen Sony’s offering for outdoor applications and expand the company’s lineup of entry- and mid-level products into new markets. This includes on-board transportation surveillance and environments with exceptionally low light conditions. All of the new cameras include key features of the IPELA ENGINE technology platform. This includes Sony’s wide-dynamic range technology View-DR, XDNR noise reduction technology, and frame rates ranging from 30 frames a second up to 60 frames a second in full HD. Sony’s three X Series cameras are full HD mini dome models. 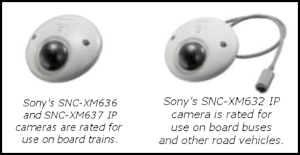 These cameras represent Sony’s first ruggedized IP cameras with image stabilization technology and a built-in microphone that make them ideal for use on board transportation vehicles such as buses and trains. The SNC-XM632 is compliant with the ISO 16750 standard and therefore recommended for bus surveillance. It is also suitable for outdoor applications such as retail, banking and education where the compact form and flat finish help it blend into its surroundings. The SNC-XM636 and SNC-XM637 are designed with different horizontal viewing angles (85 degrees and 115 degrees, respectively) and comply with the EN50155 and EN45545 standards for surveillance aboard trains. All of the X Series cameras are rated as IK08 vandal resistant and Ingress Protection rated to be dust proof and protected from water due to powerful jets (IP66). The X Series cameras are expected to be available through Sony’s product distribution channel in the first quarter of 2014. With its extraordinary light sensitivity and full HD resolution, the SNC-VB635 camera is designed for use in highly demanding applications such as transportation, city surveillance and energy. The SNC-VB635 is a fixed camera that features a half-inch Exmor CMOS sensor that generates exceptional picture quality even in very low-light conditions. Other key features include true day/night capabilities and an RS-485 external control.